Before we start, a short exercise. First, find a piece of paper and write down your five favourite albums of all time. We’ll come back to it later. I write about Rugby League for The Telegraph, although I should probably make it clear at the outset that I am not The Telegraph’s Rugby League correspondent. I cover the sport as and when big games crop up — Grand Finals, Four Nations and the like. But the term “correspondent” implies some sort of privileged knowledge or expertise, and I can claim neither. I am not steeped in the history of the game, its facts or figures or patter or personalities. I couldn’t tell you what year Featherstone last won the Challenge Cup, or indeed if they have ever won the Challenge Cup, or indeed where Featherstone is, exactly. (Yorkshire? Maybe?) If you asked me to name all the teams in the NRL, I would get to about six before pleading to consult Wikipedia. I have never played the game, at any level. I have no idea what it’s like to run into a 16st leviathan, I have never successfully executed a play-the-ball, I’ve never stood under a high kick and felt my loins quivering. And yet I feel a stirring and peculiar affection for the sport, more so than almost anyone I know. In my seven years at The Telegraph, I’ve covered about 39 sports on five continents. But if there’s Rugby League on, I’ll watch it. If there’s a game worth writing about, I’ll write about it. Those who know me well regard this as something of a quaint affectation: much as they regard the sport itself, in fact. In recent months I’ve started wondering how this all happened. I’ve lived in the south of England my whole life. No family, friends or family friends ever introduced me to it or took to me a game. Rugby League is something I discovered relatively late in life, and all by myself. And it strikes that just maybe — strangely and quite counter-intuitively — this is the purest path to true belonging. Which is not to say that my childhood was entirely devoid of Rugby League. I suppose, as with anything, those formative years must have left some sort of latent impression. Football and cricket captured me first, but these were the days when both rugby codes were freely available on the BBC, and what I do remember, I remember well. This was the early to mid-1990s, and you did not need a full set of adult teeth to spot the differences between the two codes. Time plays tricks on the memory, but my recollection of watching league was not simply that it was a fitter, faster, stronger, hungrier game, even though all those things were arguably true. It was bigger, more colourful, more plainly visceral. To the child’s eye, rugby union was a bunch of men in baggy jerseys slowly getting muddy. Rugby League was Martin Offiah charging for the line at a pale, sunlit Wembley. It was the muscles bulging in Va’aiga Tuigamala’s neck as he squirmed out of a tackle. It was a game of pure brawn, fearsome straight lines and bright bold hues. In a way, it was the difference between seeing and feeling. The Wigan side who swept all before them in the first half of that decade were the first sporting team that truly made me feel something. I found them awesome and awful. They were too good. They won too much. I hated them ardently. But then, as is often the case, real life took over. In order to be sustained, passions need to be reflected. Nobody I knew liked Rugby League, no school I had ever heard of played it, and so nascent curiosity withered on the vine. I vaguely remember Great Britain beating Australia at the 1995 World Cup; possibly even the early years of Super League. Did I imagine watching Shaun Edwards playing for the London Broncos on some idle Sunday night on Sky Sports 2? But essentially, the years between about 1996 and 2010 are pretty much a blank. The era of Iestyn Harris, Sean Long, Paul Sculthorpe and Andy Farrell almost entirely passed me by. You can go back and watch these things on YouTube, or relive them on Sky every so often, but in terms of forging memories, nothing quite beats being there. Then early in 2011, quite at random, I was despatched to Cardiff to cover the Magic Weekend. A wave of panic began to rise in me, not dissimilar to the queasy sense of discomfort felt by a man forced to do karaoke against his will. I protested once, I protested several times over. “But I don’t know anything about Rugby League,” I argued to my editor. “Nobody does,” came the logical and entirely correct response. More in hope than expectation, I did a quick Google search. Offiah and Tuigamala had both retired. Sh*t.
So I went to Cardiff, and something there grabbed me. Perhaps it was the paradox of the event, a concept almost unparalleled in sport: 12 teams in a single stadium over a single weekend, tribalism and solidarity framed within the same lens. I was impressed at how generous the other journalists were with their time, how passionately the fans extolled the virtues of their sport, not chiding the outsider for his ignorance but welcoming him into the fold. Most of all, I was awestruck by the ferocity of the rugby: a bone-crushing 16-16 draw between St Helens and Wigan, a last-minute 32-28 triumph by Leeds over Bradford. Having grown accustomed to the microwaved excellence of Premier League football, or the deathly hush of county cricket, here was a sport that not only raised the pulse, but kept it raised. I was intrigued. Neuroscientists talk about something called the “reminiscence bump”. It’s the period between the ages of around 12 and 25, when the brain is at its most potent, and when the strongest memories are formed. This is why your most powerful emotional associations – people you’ve met, places you’ve been, things you’ve watched and read – are formed between those years. Still got that list of top five albums? I’m going to wager you the cost of this magazine that with most – perhaps all – you were in your teenage years or early 20s when you first listened to them. By the time you hit 25, you have already formed the emotional connections that will shape you for the rest of your life. By that age, pretty much, you are who you are; you just get slightly richer and fatter along the way. I was 25 the first time The Telegraph sent me to cover Rugby League. And that means I could never love the sport the way you love it. The memories aren’t there. It’s not in my blood. But this works the other way, too. My relationship with Rugby League is based not on an instinctive and deep-seated sense of identity, but on rational impulses. You probably fell in love with Rugby League before you even had a chance to think about it; I thought about it, and then fell in love with it. It’s a different process, but no less valid. Back in September, I was in Leeds to cover a couple of pool games in the rugby union world cup. It was a strange sort of tournament, really: high in quality, high in public participation, and yet dreadfully lacking in something we may as well call authenticity. One Friday night, I remembered that Leeds were playing Huddersfield in the final game of the regular season. Hastily and impulsively, I finished up my work, bought a train ticket to Huddersfield and pitched up at the John Smith’s with minutes to spare. Simply outstanding piece by @jonathanliew in tomorrow’s @RLworld about his personal love affair with #rugbyleague . Must-read. Here, under the cold bright lights, was authenticity writ large. 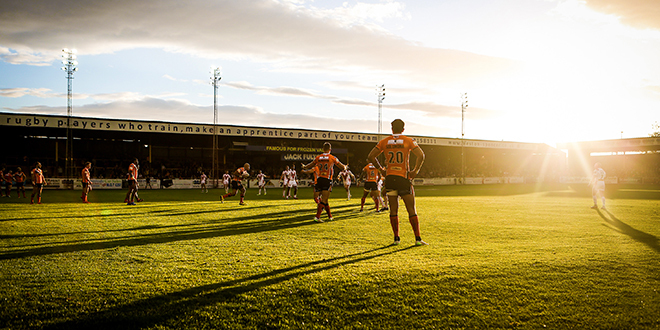 I love the sound and the smell of Rugby League, its vivid patterns, its feral but essentially dignified energy. Leeds won 20-16 with a last-gasp Ryan Hall try in perhaps the most stunning finish to a Super League season in memory. Certainly my memory, at any rate. The next day I pitched up to Elland Road to watch Italy playing Canada in the World Cup. I don’t mind union, but most of the time it looks like a sport searching for an identity, striving for a sense of purpose mislaid some years ago, which nobody can quite find any more. What sort of sport is it? An elegant grapple? A rapid ballet of pass and move? A kicking contest? A muddy courtroom drama? It’s all of these things, and less. Rugby League, by contrast, often gets described as a simple game, and often in subtly pejorative terms. And it is a simple game, but that’s really only half the story. Football is a simple game. The 100 metres is a simple game. It doesn’t make either of them any less compelling to watch. The complexity in any sport comes with time: the longer you spend within its four walls, the more you begin to see.